This is a Sponsored post written by me on behalf of Giant Eagle. All opinions are 100% mine. Have you tried Knorr side items? I’ve been eating them for years. They have a variety of ethnic side dishes, rice sides, and pasta sides. Now with just a few fresh ingredients it’s easy to take a Knorr Side and turn it into a delicious main dish! Knorr Pasta Sides can be found at Giant Eagle. Currently you can get an amazing downloadable Free Recipe Book with lots of great dinner ideas made with Knorr Sides from the Giant Eagle website. The thing I like best about these main dishes is how simple they are! It only takes a handful of ingredients, 20 minutes or less, and you have an easy and tasty dinner that’s perfect during the week. 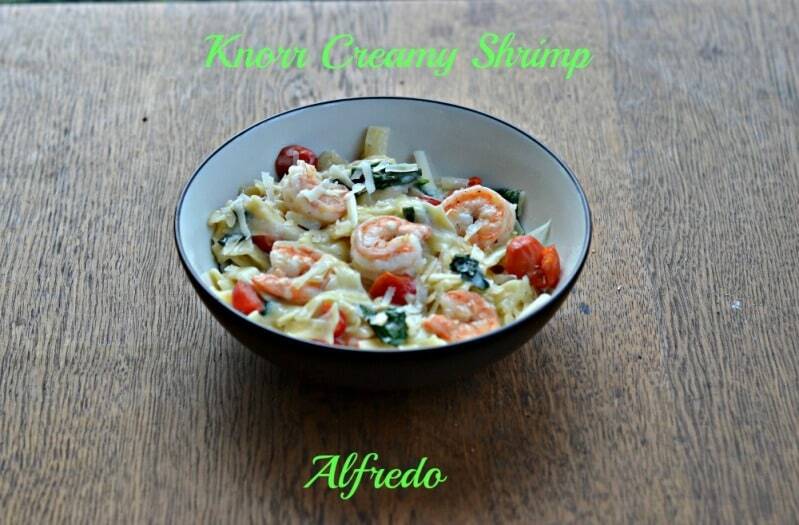 I tried the Knorr Creamy Shrimp Alfredo. This recipe takes the Knorr Pasta Sides Alfredo and tosses it with fresh baby spinach and cherry tomatoes. Shrimp are sauteed on the side and then everything is tossed together. I sprinkled it with a little Parmesan cheese and served it with a fresh salad for a complete meal ready in just 15 minutes! Prepare Knorr® Pasta Sides™ – Alfredo according to package directions, stirring in tomatoes and spinach during the last 5 minutes of cook time. Meanwhile, heat oil in large nonstick skillet and cook shrimp, stirring occasionally, until shrimp turn pink, about 5 minutes. 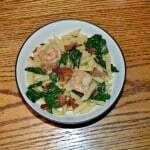 Stir cooked shrimp into hot Pasta. Sprinkle with cheese. 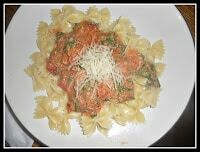 What’s great about this dish is that any vegetable can be substituted for the spinach and tomatoes. Instead of spinach why not try fresh broccoli florets? 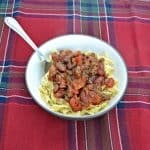 If you don’t have any tomatoes, try sun dried tomatoes. You can even substitute a pound of chicken for the pound of shrimp! Each is just as easy as the last but can be customizable to your family’s likes and dislikes. That looks so delicious! My kids love shrimp too! Look delicious! 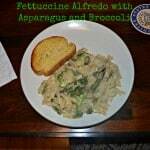 I never thought to add to the package and turn a side dish into a meal! I will now!! Thanks! It’s surprisingly really good and with the shrimp and veggies it’s awesome! Love how you took something that came from a package and dressed it us so nicely.